Comfy chairs, ergonomic chairs, posture correcting chairs, all well and good – but like everyone, designers sometimes like to bend the rules and be bad, oh so bad! 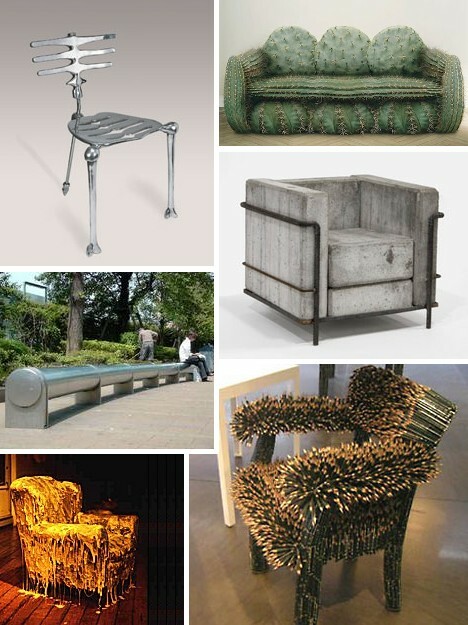 These 13 uncomfortable chairs show that even the best furniture designers take (and give) pains to stretch the limits of their art. 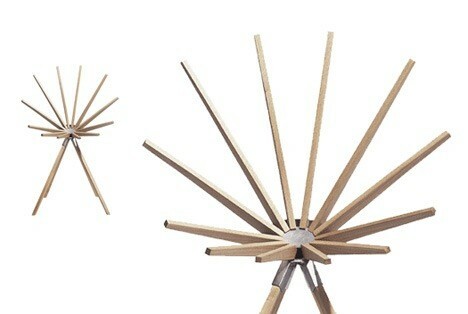 The Pencil Chair: Get The Point? You could say German artist Kerstin Schulz might not be the sharpest pencil in the box, but that’s understandable as she’s worn out every sharpener within reach to create a suite of furniture only a lovesick porcupine could love. 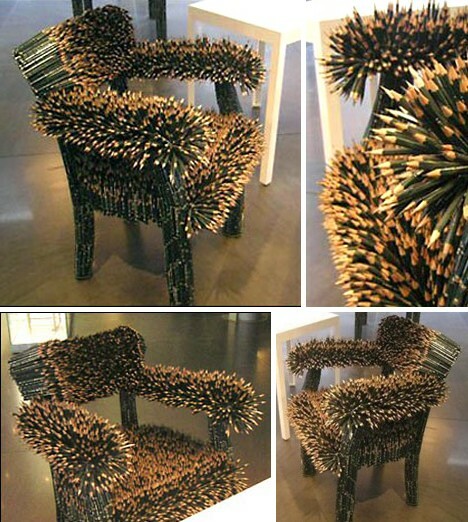 Just looking at her graphic graphite Pencil Chair is giving me lead poisoning… and don’t even ask what she did with all the shavings. Schulz was commissioned to craft something special for Faber Castell’s 100th anniversary exhibition in 2005; we can bet she’s looking forward to doing something similar for Bic. Here’s the perfect chair to have when you need a friend to help you move… and you happen to really hate your friend. 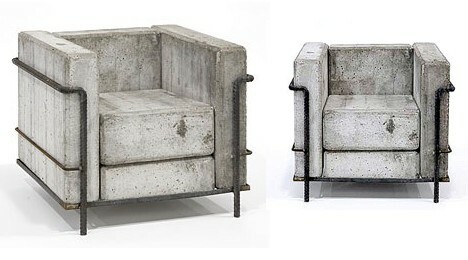 Stefan Zwicky’s 1980 homage to the classic 1929 Le Corbusier Petite Chair has little to recommend it besides rock-solid durability – and one ton of mass. Comfort zone? More like Twilight Zone. Plunk this concrete chair in the middle of the Sahara Desert at high noon and it’ll STILL be cold & clammy. 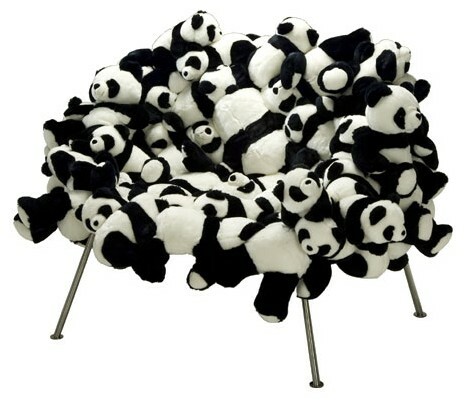 The Banquete Chair with Pandas by Fernando and Humberto Campana is said to be a limited edition – no surprise, there aren’t that many pandas left after all. 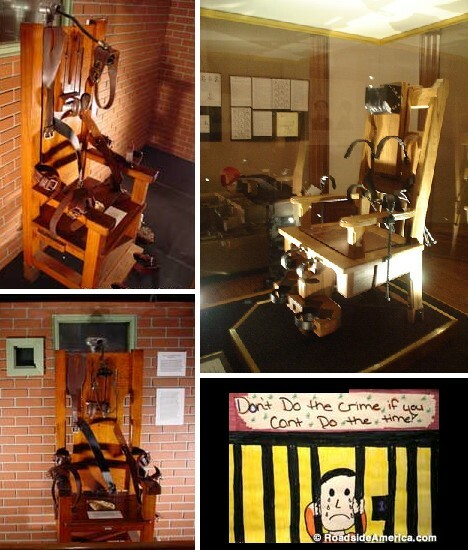 Especially after the Brothers Campana cobbled together 25 of these somewhat disturbing chairs. OK, they’re not made of REAL pandas but they’re still uncomfortable, at least to look at. Actually sitting on the Banquette Chair is probably extremely soothing for your body, just not for your soul. The Stick Chair comes to us courtesy of Carlo Volf of Danish design firm Volfdesign, though from the looks of it “courtesy” isn’t one of Volf’s better qualities. It’s doubtful he has a soft spot for comfort either, since YOUR soft spot will never forgive you for sitting in this chair. 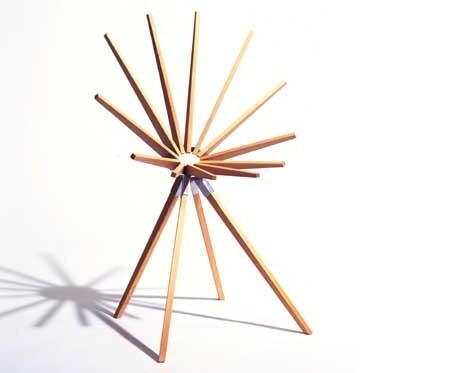 Designed for the 2005 Carpenter’s Autumn Exhibition, “Stick”, as Volf calls it, will definitely stick it to you… where the sun don’t shine. The Cheese Chair: What’s That Smell? Like a little Limburger with your La-Z-Boy? Maybe a lot? Step right up and sit right down. Cosimo Cavallaro’s Cheese Chair is either cool, or it stinks. Literally. 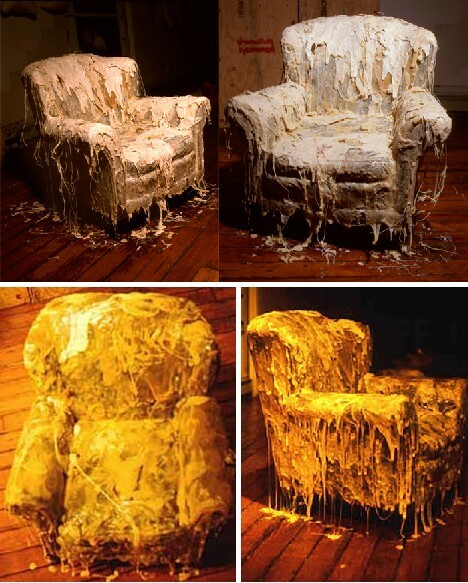 When you design a chair covered in cheese there just isn’t any room for compromise. Compro-mice, maybe, but I digress. The 1999 curvaceous curd-aceous cheesy chair is just one example of Cavallaro’s specialty, food art. Looking to visit the artist’s studio? Book a flight to Montreal, Quebec, and follow your nose. 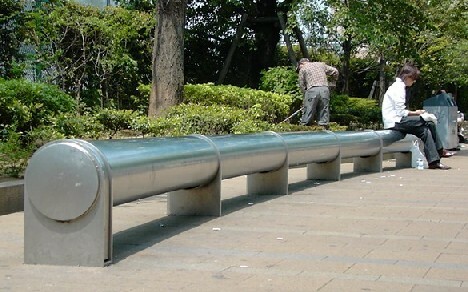 Anti-Homeless Benches: Sit, Now Git! 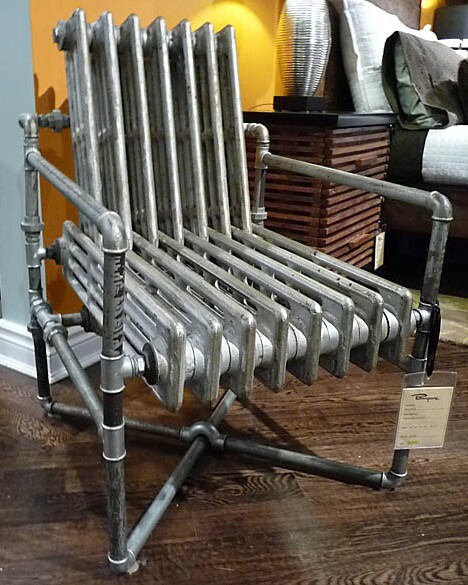 “Made from 80 year old radiators, this chair is surprisingly comfortable.” That just may be the case, since the Radiator Chair looks unsurprisingly UNcomfortable. It also looks somewhat out of place among the traditionally styled offerings at the Barrymore Furniture Galleries in Toronto… until you glance at the $1,430 written on the price tag. The Radiator Chair comes with an optional companion piece: a $1,200 end table that sports a red valve handle on one front leg. Don’t turn it, whatever you do! 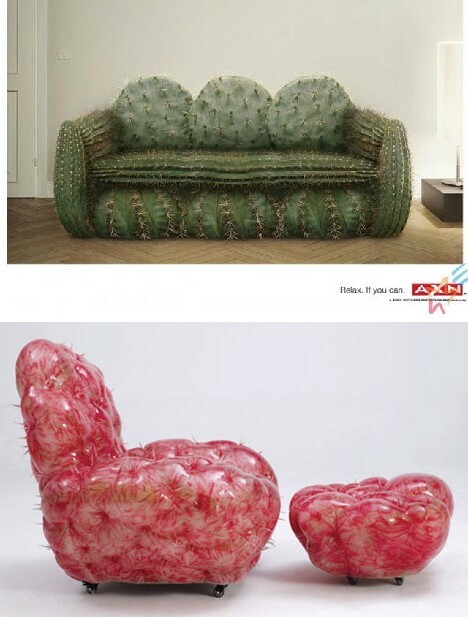 Cactus Couch: Me So Thorny! Not just merely uncomfortable, it’s Sofa King uncomfortable! Looking like a gag gift for Wile E. Coyote, the “Ouch Couch” is (thankfully) not real, but a processed graphic image. The diabolic divan starred in a series of ads for Sony’s AXN pay television, cable and satellite television channel in conjunction with the tag line “Relax. If you can”. Just below the ultimate tough-love seat is a hand-molded silicone chair & footstool combo modeled after a prickly pear – and what a prickly pair they are! 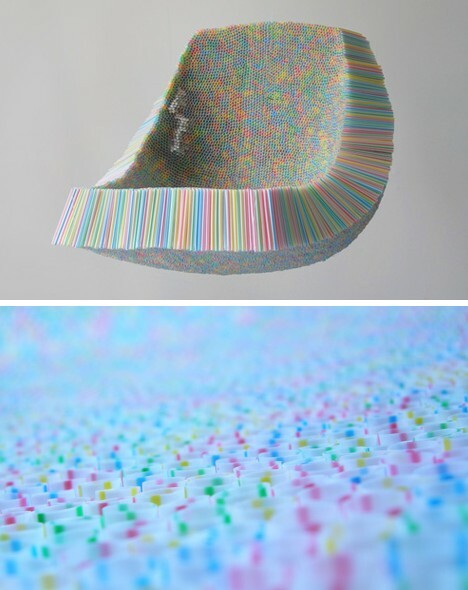 It was featured at the China Chair Project art exhibit and is the work of artist (and sadist, obviously) Xiang Yun. 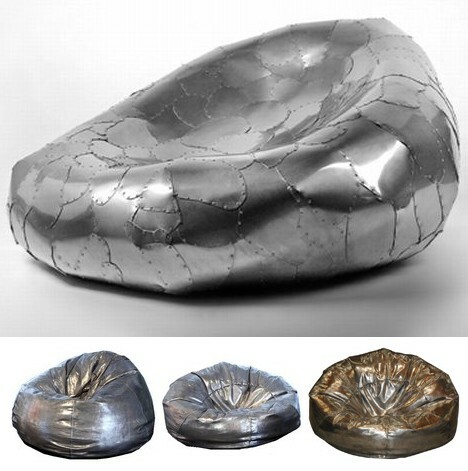 Rick Ivey’s “1825” steel beanbag chair displays the rough-edged, riveted look of an Industrial Revolution boilerplate steam engine – just the thing you DON’T want to sink into at the end of a hard day’s night. The $4,500 price tag, however, WILL make you weak at the knees. Going green, getting back to nature, growing your own… it all sounds comfy & cozy, doesn’t it? 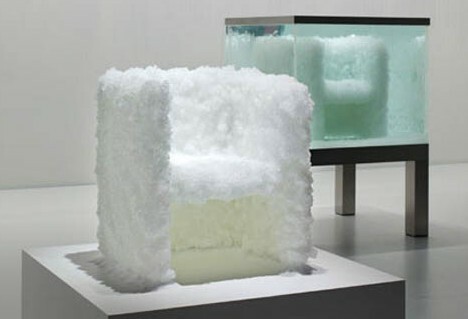 Well, not always – as the Venus Chair by Japanese designer Tokujin Yoshioka illustrates. 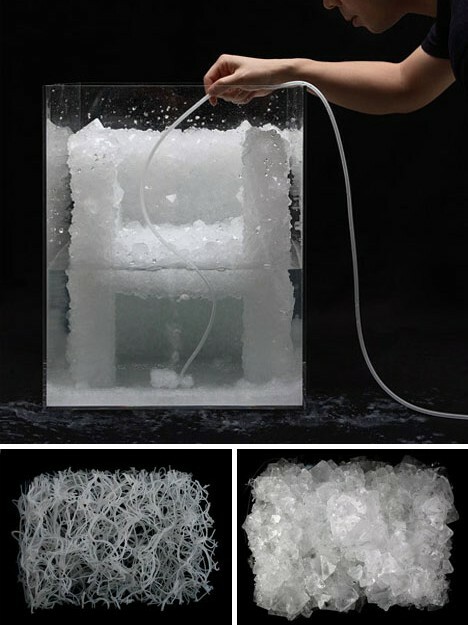 Grown in a tank filled with a supersaturated solution, the Venus Chair slowly takes shape as tiny crystals precipitate out of the solution and onto a prepared chair form. Tiny SHARP-EDGED crystals, growing bigger, sharper, pointier by the minute. Just the thing you’d like to plop down on – which is perhaps the reason the Venus Chair is in the running for this year’s Brit Insurance Furniture Award. No dummies, those guys. 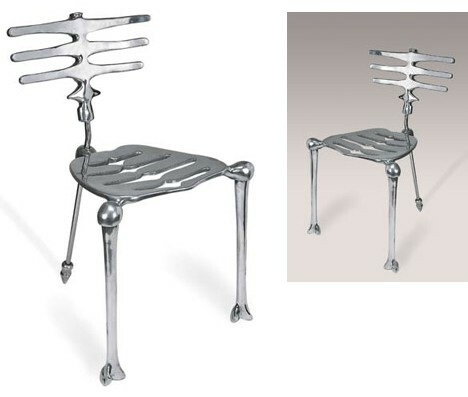 Commenting on his polished aluminum and steel Skeleton Chair, designer Michael Aram states “The shape of the human body is a great source of inspiration. Stripped of its skin, it becomes an arresting and unexpected natural form.” Sure Mikey, but this arresting and unexpected chair is the last thing most people would look to when they need to take a load off their feet. If “adding drama to your living space” is your thing, however, prepare to bone up $650 for the privilege.